(DETROIT – April 9, 2019) – Due to the anticipated damp conditions of the main lawn parking lot at Meadow Brook Amphitheatre, guests attending the blackbear and KYLE Spring Concert this Friday, April 12 at 7 p.m. will be directed to park in paved lots on the campus of Oakland University, and will be provided shuttle bus transportation to the amphitheatre. Guests are advised to arrive early and park at Lots P35 and P37 located on the university’s grounds at 253 Pioneer Drive, Rochester, MI 48309. Parking attendants and police will be stationed along the route to provide additional directional guidance. Shuttle buses will run from 3 p.m. until 1 a.m., picking up and dropping off patrons within the two designated surface lots. 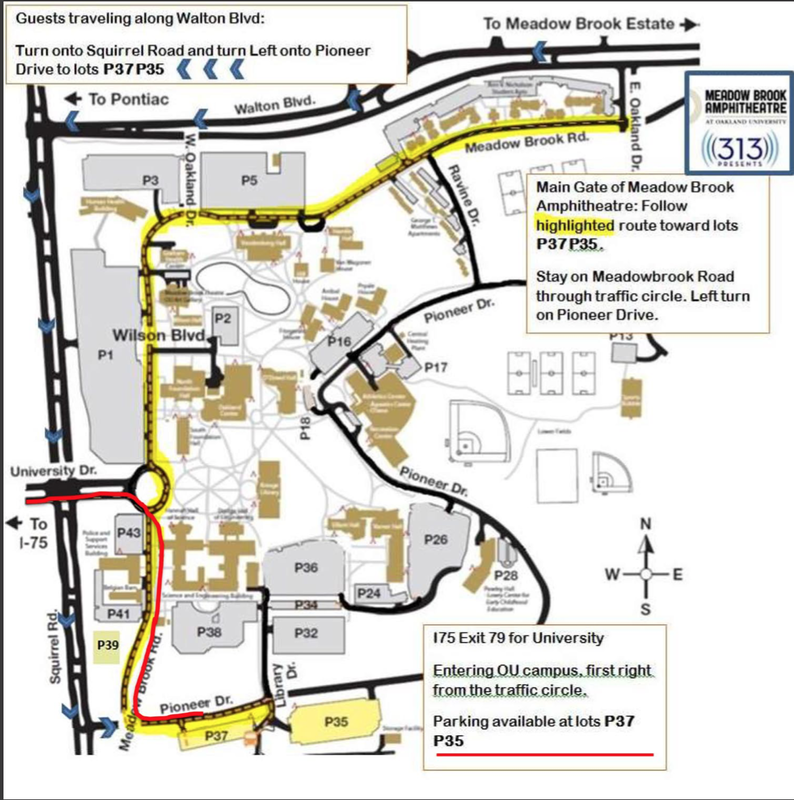 • Guests traveling from I-75 are advised to use the University exit (exit 79) and proceed eastbound on University Drive onto Oakland University’s campus; turn right at the traffic circle to southbound Meadow Brook Road; turn left on to Pioneer Drive. • Guests arriving from westbound Walton Boulevard will be directed to turn onto southbound Squirrel Road; turn left onto Pioneer Drive. Also, please be advised the Road Commission for Oakland County (RCOC) recently restarted construction on Walton Blvd. between Squirrel and Adams roads which require single lane closures in each direction. Two-way traffic will be maintained throughout the project and all side street and driveway access will be maintained. Project information and updates can be found at: www.rcocweb.org/456/Walton-Blvd. Ticketed VIP and ADA Accessible parking guests will continue to park at Meadow Brook Amphitheatre’s regular paved VIP Parking lot by entering off Adams Road and following the posted directional signage. • Doors open at 5:30 p.m.
• Show at 7 p.m.